I Can Top That: Potty Training NO NO!! 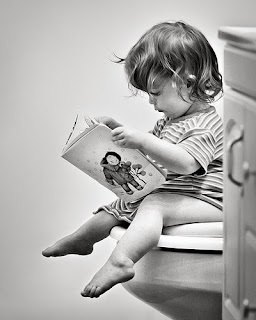 I took my newly potty trained daughter to the public bathroom at Wal-Mart because she had to go "potty". Once in the bathroom she got into the stall and as she was starting to pull her pants down proceeded to yell out loud "I gotta go poop really bad!" I heard a few people snicker...ok a little embarrassing. She gets up on the toilet and scrunches up her face and starts to grunt, loudly....again heard a few snickers. Then she said "wow thats a really big turd mommy it hurts really bad and keeps grunting" By this time everyone in the bathroom is laughing and I meanwhile, am mortified. Needless to say we sat in the stall until everyone else left.